T he day has arrived (or did on Tuesday): Putting the Science in Fiction has launched! 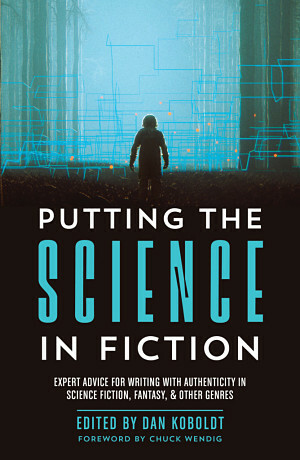 This fascinating tome contains 59 essays by scientists and other experts, written at a level to help authors integrate believable science into their writing. Includes a foreword by Chuck Wendig – and more importantly, a chapter by me on cyborgs and cybernetics! As of today, Amazon has the hardcopy only, not the ebook. So why not support your local bookstore and get it through Indiebound instead? For more options, scroll down in the publicity link above. If you check it out, put up a review on Goodreads and/or Amazon! Your feedback will help sales, and help get this book in front of more rising authors of speculative fiction. This entry was posted in Books, Publications, Science on October 18, 2018 by bckinney. NeuroThursday takes a hiatus from its hiatus this week! Read on through to see how a recent article about dopamine in beliefs can get us thinking about what’s meaningful, and what we do with the meaning we detect in our lives. This entry was posted in NeuroThursday, Science on October 11, 2018 by bckinney. 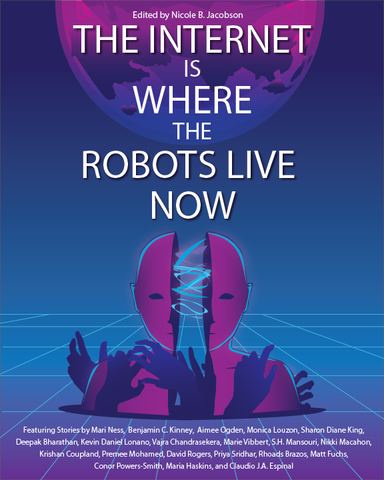 Check out this awesome cover for “The Internet is Where the Robots Live Now,” the upcoming anthology with my Brave Little ToasterMining AI story – now available for preorder! Preorder your copy today! Contains original short stories from myself and nineteen other excellent authors including Vajra Chandrasekera, Maria Haskins, Premee Mohammed, and Aimee Ogden. This entry was posted in Publications, Short Stories on October 2, 2018 by bckinney. Does Science Fiction Still Give Us Hope? Science Fiction has shown us the greatness we could strive for in the future. Is it still capable of that or are we too jaded? Plenty of our favorite worlds have their own religion, or have a mix of real world religions. How do they stem from what we know in the real world? Characters don’t always have to be human. Discuss how to effectively create a POV for an animals or other non-human character. I’m going to have a busy Saturday midday, but your presence and enjoyment shall carry me through! This entry was posted in Appearances on September 20, 2018 by bckinney. 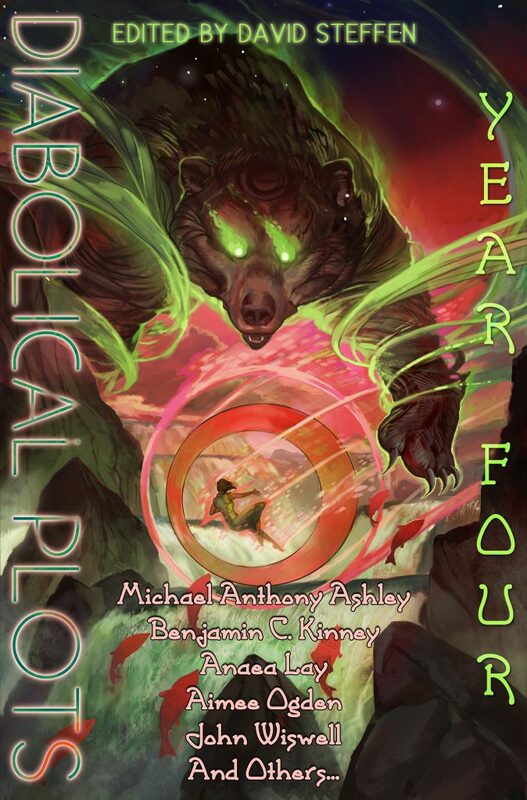 Earlier this month it was available for preorder, but now it’s live: you can get the Diabolical Plots Year Four anthology at your favorite ebook retailer! 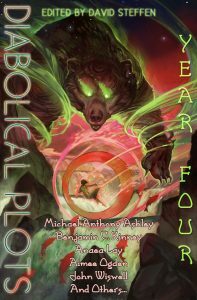 This is one of the stories to appear in the anthology before it comes free online at Diabolical Plots. You could sit tight for another couple of months… but why wait, when you can get it as part of such a delightful anthology? In early drafts, the beach had bioluminescent jellyfish, an explicit homage to the Martha’s Vineyard jellies familiar to alumni of Viable Paradise. Alas, their metaphorical value was too flimsy to survive edits. Nevertheless, you can blame Robert Dawson for the writing prompt. In early drafts, the statuette was a rocket ship rather than a motorcycle. Specifically/implicitly, it was somebody’s Hugo award. I cut that for excess self-indulgence. This entry was posted in Publications, Short Stories on September 17, 2018 by bckinney. 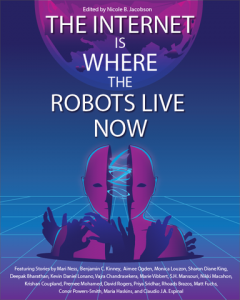 I’m pleased to announce that my little science fiction epic “Elegy of Carbon” will appear in The Internet Is Where The Robots Live Now, the inaugural anthology from Paper Dog Books. It’s an anthology about the future of human-robot interactions, and my story takes that out to a space-opera future. The anthology is due out in late September, so hopefull I’ll tell you all more about it in a month or two! This entry was posted in Short Stories on August 13, 2018 by bckinney. Joe Iriarte and I are sharing a reading slot. Come listen to our awesome projects! I will probably read something about my favorite baby artificial intelligence, but no promises. I only promise awesomeness. • This solo presentation is an updated version of the talk I gave at the 2017 Nebula Conference, so if you missed it there, now’s your time! If you’re a member of the Viable Paradise community, I’ll see you there! In 2017, 60 million people tuned in to podcasts, and episodes of Welcome to Night Vale had already been downloaded over 170 million times. Audiobook sales are skyrocketing. Podcast production value and diversity in formats and voices are improving daily. This panel will discuss the radio dramas, short story podcasts, serials, audiobooks, and other listenable forms of speculative fiction, and how they’re influencing storytelling. 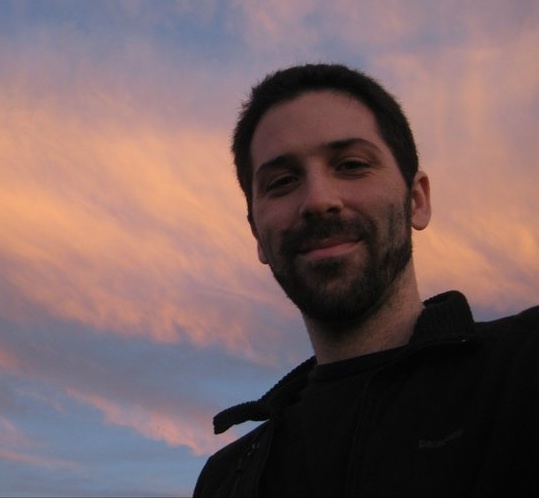 Want to talk to me about neuroscience, Escape Pod, or anything else? Let’s get a coffee and nurse our hypothetical hangovers together! This entry was posted in Appearances, Science, Viable Paradise on July 6, 2018 by bckinney.